The cold winds and freezing temperatures of winter have passed and spring is drawing near. In Korea, spring temperatures range from 5? to 20?, and the return of warm weather brings wild flowers to bloom all over the country. 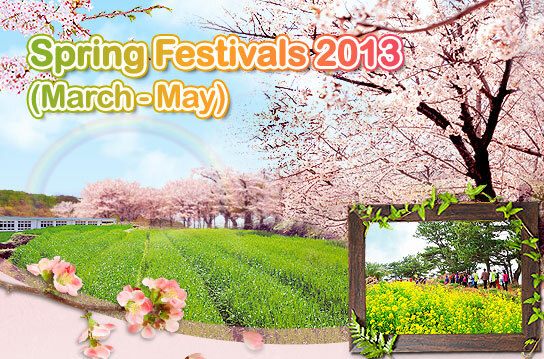 As the weather improves, so do people's spirits, and springtime festivals are held throughout the country. There are plenty of opportunities to enjoy the good weather by participating in Korea's flower, food, and culture festivals. Description: Taking place in the hot spring area ofJirisan Mountain, the Gurye Sansuyu Festival features various hands-on programs like cornus fruit liquor making and sampling of cornus fruit makgeolli. A number of performances such as pungmulnori (farmers' music performances), Korean traditional music, and fireworks displays are held throughout the festival period.